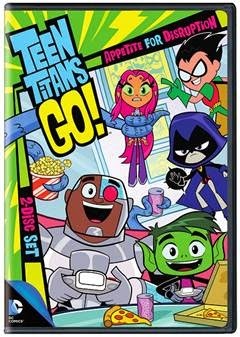 Teen Titans fans can relive the latest adventures when Warner Bros. Home Entertainment (WBHE) releases Teen Titans Go! : Appetite for Disruption Season 2 Part 1 on DVD April 14, 2015. The two-disc DVD set is priced to own for $19.97 MSRP. Teen Titans GO!, which consistently ranked as the #1 show for kids 6-11 on Cartoon Network has been renewed for a third season of fun and mayhem. In Season 2 Part 1, the Teen Titans return with a whole new bevy of baddies, beverages and adventures! Partner up with Robin, Cyborg, Raven, Starfire ,and Beast Boy to defend Jump City against slimy monsters, tyrannical villains and of course, crime fighting induced hunger pains. Every vote counts when the Teen Titans hold team leader elections, Beast Boy dials up the “man-factor” with his new robotic limbs, while Raven races to save the cotton candy bushes from the Gumdrop Goblin. It’s a titan red alert with 26 gut-punching, gut-busting adventures in this all-new collection.